Designing your landscape can seem a bit intimidating. However, if you break it down into small steps and keep a few things in mind, it isn't hard. The first thing you must do is discover what kinds of plants will grow in your area. This is made easier in the United States because the United States Department of Agriculture (USDA) has divided the country into zones based on how cold it gets in the winter. You can find your zone by looking at the USDA Plant Hardiness Zone Map or by asking your Extension agent or nursery employee. For example, zone 1 gets down to negative sixty to negative fifty-five, while zone 13b gets down to sixty-five to seventy in the winter. Obviously, plants that grow in zone 13b will not grow in zone 1. You can plant things that are not hardy at your zone if you plan for them to die each winter and to replant them each spring, or put them in pots and bring the inside during the winter. The next thing to consider is the different conditions in your yard. An area is considered sunny is it gets at least six hours of sun a day. Partly sunny areas get four to five hours of sun a day and shady areas get less than three hours of sun a day. Sunny areas are the easiest to grow plants in, although there are plants that thrive in partly sunny areas but cannot tolerate full sun. The choices for full shade are rather limited. Another thing to consider is exposure. A plant may not do well when planted in the middle of the yard where it is exposed to the wind and rain. If planted against the southern wall of the house (the warmest part of the house), it may thrive. Consider some plants as tender in your zone and plant them against buildings where the radiant heat from the building creates a microclimate that is warmer than the rest of the yard. Sometimes you can get away with planting something that is a zone warmer than you are if you use this trick. You must also consider the drainage in your yard. If there are places where water stands, you must improve the drainage there before planting. Very few plants like to grow in standing water. These areas are ideal for raised beds to increase the drainage and create a focal point in the garden. Areas where the drainage is too good, such as sandy areas, may need compost or other organic matter mixed in to make sure the water stays long enough for the plant's roots to absorb it. 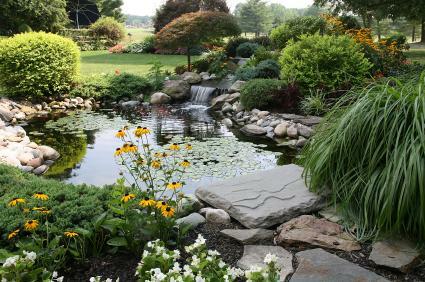 A landscape design can be very formal or very informal. It can be designed to mimic Greek or Roman styles, English gardens, a potage garden, or it may be designed in a more eclectic style. Whatever style you choose, it is important to maintain it throughout the landscape so that it looks planned, rather than scattered and muddled. You can find plans for different types of gardens in landscape books or in pictures of famous gardens. When considering what plants to add to your garden, the right mix will depend on factors like height and blooming times. All plants are not the same size. This seems obvious, but it is often overlooked when planting a garden. It is best to put tall things at the back of the flower bed or feature, then intermediate plants, then finally the small plants in front. Putting the taller elements in front obscures the smaller ones. For example, if you plant snapdragons behind bluebonnets, you can see both plants. If you plant the snapdragons in front of the bluebonnets, the bluebonnets are hidden by the snapdragons. You can tell how high a plant is going to be by the information on the tag or seed packet. 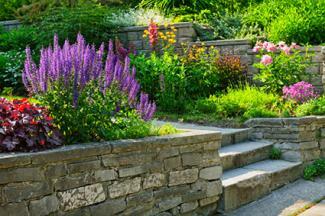 One way to extend your enjoyment of your landscape is to succession plant. Plant daffodils or other early blooming plants, then plants that bloom when the daffodils fade, and more plants that bloom when those plants fade. This way, you always have color in your landscape and it does not look barren except for the depth of winter. Do not make the mistake of over planting your yard. When planning for your landscape, remember that things grow. Shrubs and trees should be planted with enough space around them so that when they mature, the are not crowded or crowding another element in the landscape. Pecan trees should be planted away from buildings and cars because they self prune, dropping limbs unpredictably on anything under them. Smaller plants will grow, too. This is particularly true of perennials, which may be small the first year they are planted before growing quite a bit the second year. Be sure to read the plant label or seed packet and plant things far enough apart that they do not crowd each other at maturity. Suppose you have just moved to Hunt County, Texas. You have a house with mature oak trees in the back yard and no trees in the front yard. The back yard, as a result of the trees, is partly sunny, while the front yard is sunny. You consult the USDA Plant Hardiness Zone Map and find that your new home is in zone 7b. Now you know that it gets down to five to ten degrees at its coldest in the winter. Anything that cannot tolerate that much cold must be grown as an annual or grown in a pot and brought in each winter. If you live in a different zone, your county Extension agent can give you a list of plants recommended for your area. Most nurseries will also give you information on plants that thrive where you live. You decide on an eclectic style for your garden rather than one of the more formal styles. You could consult articles on formal garden design or herb garden layout for other types of garden designs. At your Texas home, you decide you want to plant shade tolerant plants in the backyard and plants that prefer sun in the front yard. How do you know what plants those might be? Consult landscape guides and sites such as the Better Homes and Gardens Plant Encyclopedia to find plants. Texas has a wonderful resource called the EarthKind Plant Selector that will allow you to select plants by height, sun tolerance, water tolerance, and a number of other details. You decide you want shrubs at the back of your front flower bed. You prefer that they remain small, so that they do not obscure the windows. You merely click small shrub undergrowth habit, and sunny under exposure, and you get a list of shrubs to choose from. If you click on the shrub, it tells you all about the plant. You choose a Japanese barberry because it only gets to be four to six feet tall. 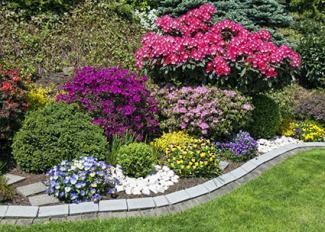 Most flower beds look best with a mixture of perennials and annuals. Accordingly, next, you pick a perennial to go in front of the shrubs. The lanceleaf coreopsis catches your eye. It gets to be four to six inches tall. You now need an annual that is smaller than the coreopsis for the front of the bed. 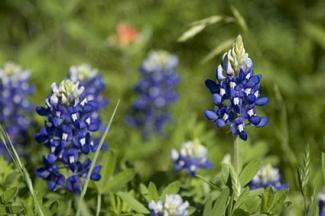 You decide on bluebonnets, which grow twelve to eighteen inches tall. You realize this is taller than the coreopsis, so you put the bluebonnets between the shrubs and the coreopsis. Now, since bluebonnets bloom in the spring and the coreopsis blooms spring and summer, you decide to line the bed with daffodils, which bloom much earlier than the bluebonnets and the coreopsis to extend the time you have color in your bed. Landscape design is not difficult if you follow a few simple steps. Remember to plan for growth in your landscape. In fact, the first year your landscape should look a little sparse since all the plants are still babies. It will take three to five years for your landscape to develop fully. Enjoy watching it mature into a beautiful place to live.